“seldom have so many countries of the world, races and nations sent their representatives to so small a place with the praiseworthy intention of killing one another”. General Hans Kannengiesser, Germans commander of a Turkish Division at Gallipoli, 25th April 2015. Along with Australians, New Zealanders, Maoris, British, French and Senegalese, the Indians sent some of its troops to fight in Gallipoli. The Gallipoli peninsula is situated in Turkish Thrace with the Dardanelles strait to the east and the Aegean Sea to the west. The importance of the battle here was to force to force passage of the Dardanelles with Allied warships in order force a Turkish surrender and end the war. This was not to be the case. Professor Peter Stanley mentions in his recent book Die in Battle, Do not Despair – The Indians on Gallipoli, 1915, that the Indian contribution was highly significant. More than 16,000 Indian troops were involved in one of the bloodiest campaigns lasting for eight months. 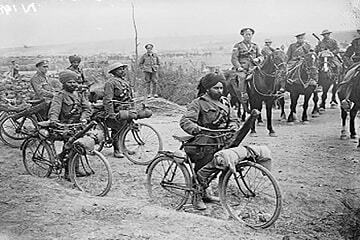 Yet there is hardly a mention of the Indian contribution in most accounts of this crucial WW1 campaign. For India, there were additional repercussions linked to the Indian Muslim population. Lord Hardinge, the Viceroy of India had noted with concern in early 1915 that if the Allied suffered more reverses in the Dardanelles, he feared ‘serious results’ in India. It was because of this fear that original battalions of the Indian brigade, the 69th and 89th Punjabis, were withdrawn owing to their large Muslim composition. They were sent on to fight in France instead. The Indian troops served in the Helles area in May and early July took part in the August offensive and the Indian artillery landed with the ANZAC (Australia and New Zealand Army Corps) sharing in with their difficulties from 25th April to the evacuation in December. The first significant action of the brigade was the capture, on 12th May, of a hill feature on the coast west of Krithia. This feature was christened the ‘Gurkha Bluff’ owing to the good work done by the 1-6th Gurkhas on this occasion. The next major action was at the Third Battle of Krithia on 4th June 1915. The 14th Sikhs, composed entirely of seasoned Jat Sikh soldiers, fought valiantly against heavy enemy fire and on that day, almost the entire battalion was wiped out. Gallant counter-attacks in which heavy punishment was inflicted on the Turks on 3rd and 5th July marked the end of serious fighting in the Helles area. By end July the India troops of the Mediterranean Expeditionary Force were brought up to strength to take part in the last major attempt to break the stalemate by a bold and ambitious plan. The first step of this plan was to capture the summit of Sari Bair Ridge. The only unit to reach the crest of the slope was the 1-6th Gurkha Rifles on 9th August. Unfortunately, as they advanced to towards the reverse slope, they were hit by artillery fire and a Turkish counter-attack drove them from the summit. The last battle where the Indian brigade took part was the action of Hill 60 on 21st August which was successfully captured. The final evacuations of the peninsula took place on the 20th December. The Indian story of this campaign cannot be complete without mentioning the Indian mule transport without whom this campaign would not have been able to sustain itself. The Indian mule transport was pulled from France and consisted of 4316 mules and 2000 carts.